Thanks to HGTV and motivated millennials, the home improvement industry is booming. In fact, it’s estimated that Americans spent more than $380 billion last year on home improvements. Of all the home improvement projects, bathroom and kitchen floor renovations led the way. For many people, the kitchen is an integral part of their home. Not only is it the place where families cook and break bread, but it’s also the heart of the home. But don’t worry, we’re here to help. In this guide, we go over everything you need to know about choosing the best tile for your kitchen floor. 79% of home improvement projects involve the kitchen. We already went over the reasons why, but there are a few more things to keep in mind. The first is that kitchen updates are not cheap. The average kitchen reno costs around $22,700. We told you isn’t wasn’t cheap! But, you have to look at the workmanship and materials that go into it. Think about it: Most kitchens these days want granite countertops. Other popular options are quartz and Carrera marble. The cabinets have to withstand heavy use from your family members. They also have to hold the weight of plates, glasses, and everything else you store in them. Then, there’s the flooring. The kitchen is a high-traffic area so you want heavy-duty flooring that can handle it. In the early 20th century, linoleum was all the rage in kitchen flooring. It’s still used today but to a lesser degree. That’s because technology has evolved. Logistics make imported materials easier to get a hold of. Which leads to — what seems like — thousands of flooring choices. We’re going to help you navigate through your options, so you can pick the best tile for your kitchen. There are some things to consider before we get into all your options. As we mentioned, your kitchen is a high-traffic area. Thus, you need durable flooring. This may mean that you don’t choose the cheap stick-on tile to save money. These are popular, but they don’t last long. The corners will come up, they tear, and the adhesive may give out. You’ll know a tile’s durability by its PEI rating. This is a system that tells you, in essence, where the best place to install a certain tile is. Not all manufacturers list the PEI rating for their tiles. But, most will at least give you a recommendation for the location where you should install it. Tiles come in a variety of sizes. You may love the look of a 24″ tile but if you have a smaller kitchen, using it may not fit well or doesn’t look well-proportioned. At the same time, the smaller, decorative tile may accent your countertops and complement your aesthetic, but may not give you the durability you want. They also may not be cost-effective. It’s very common for people to use 12″ tiles in the kitchen. Some even prefer 18″. In all cases, you have to make sure you have exact measurements. Measuring incorrectly and not ordering enough tile are two of the biggest mistakes in DIY flooring projects. You can avoid a lot of headaches by hiring a flooring contractor, but if you’re going 100% DIY, be sure to measure the area more than once. As a follow-up, make sure you buy enough tile for the project. Flooring stores and even big-box retailers do sell out of products. This means, just because there were dozens of cases available on Friday doesn’t mean they’ll be there Monday. When it comes to color, you have a lot of options. This comes down to what you like and what will match the rest of your kitchen. But take into consideration that while darker colors may “hide” more, they’ll make your kitchen appear smaller. Lighter hues will brighten your space and make it bigger, but won’t hide much. Texture and safety go hand in hand. Textured and matte tiles are less slippery than glass or smooth tiles. Your kitchen floor will get wet at times, and even slippery from spills. Keep this in mind when you buying your tiles. If you’re a first-timer, prepping and installing tile is a challenge, but it’s not impossible. Make sure you follow the manufacturer’s suggestions. You also need to use the right tile saw. Many equipment places rent them out but keep in mind, you can buy a wet table saw for less than you think. Don’t forget your installation job needs more than tile and a saw. You also need tile spacers, a level, a trowel, and a grout float. Make sure you read our top tips for using tile spacers effectively before you start your tiling job. No one wants to spend their weekends on their hands and knees cleaning tile. But, proper maintenance ensures you’re getting the longest life possible out of your flooring. We’ll discuss the maintenance of each of the tiles below. Hardwood flooring is as popular as ever. If you live in an older home, you probably have it throughout your house. This includes the kitchen. But, natural hardwood is high-maintenance. You need to re-seal it every so often and it can get scratched. Laminate is more durable, but may not match your existing hardwood flooring. Wood-look tile is a popular alternative. They’re made of porcelain but the finish resembles wood. These are tricky to install, so be sure to read up on all the unique challenges you’ll face. Porcelain and ceramic tiles are often confused. They look alike and share the same colors and sizes. Believe it or not, there are differences between them. Porcelain has added sand to its clay mixture. It’s made with heat and pressure so the result is a harder and denser material than ceramic. It’s also less porous. Because of its durability, porcelain tiles are also installed outside in patios or lanais. They withstand any climate, so they’re pretty versatile. The coloring additive gets added to the clay, so it’s a richer color that won’t fade as easily as other types. Glazed porcelain is different. During the firing process, the material gets glazed, to give it a glass-like effect. The color gets added during the glazing process, so it may appear uneven. It also scratches easier than non-glazed. That said, it’s also more slippery than non-porous porcelain. Installing porcelain tile requires special tools — and patience. If you’re going at it alone, make sure you follow the manufacturer’s recommendations to a tee. RUBI’s DS-250 and DS-250-N Laser & Level tile saw works for both ceramic and porcelain, but it’s in its ability to cut the latter where it shines brightest. The TP-T tile cutter is ideal for porcelain. Ceramic tiles are softer and more porous than porcelain. Ceramic also goes through a glazing process to create a harder surface. They’re available in any color you can think of and in many different textures. While it is softer, the glazing gives it a surface where cleaning up spills and stains is a cinch. They’re low maintenance and durable, which is why they’re the favorite among kitchen remodelers. It’s also easier to install than porcelain. Now, installing any tile is difficult if you’ve never done it before. And even if you have, one misstep can throw off the whole project. Taking your time during the prep work will make the job smoother. Also, be sure to check out our step-by-step guide for installing ceramic tiles. RUBI was founded in 1951 with the initial goal to solve problems in cement cutting. 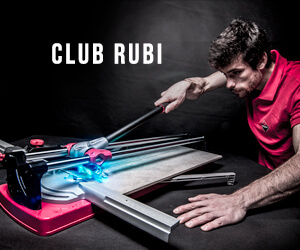 Today, RUBI is still the leader in ceramic tile cutting. The ND-180 tile saw offers the perfect solution for cutting tile on the go or several locations. The DU-200-Lite tile saw is for renovations and light work. The TZ tile cutters have incredible power and the TX-N tile cutters offer unparalleled precision. Because these are natural substances, they must get re-sealed every two to three years. There are also two types of stone tiles: polishes and honed. Polished stone, like marble, is slippery. Sometimes it doesn’t even have to get wet to cause a slip and fall! But, polished stone is gorgeous and the natural beauty of the material can shine through. In general, honed stone has a rougher texture. It also has a duller color. But, you can find travertine in many textures and finishes. Stone tile, in general, comes in larger sizes and is more expensive than porcelain and ceramic tile. It also requires different saws and cutters than ceramic and porcelain. When it comes to saws, the RUBI DX-350-N Laser & Level or the DT-180 Evolution wet tile saw should be among your top choices. Tiling or re-tiling your kitchen is the quickest way to give it a facelift. But, you have to make sure you’re choosing the best tile for your kitchen floor. Decorative tile or glass-like textures look beautiful, but are slippery and may not hold up as well as you need them to. Stone tiles are rugged and durable but are high-maintenance. Ceramic and porcelain are classic choices but wood-like tiles are becoming more popular. If you’re still unsure of what kind of flooring you should choose for your kitchen, check out our tile idea blog. After you decide on your tile, there’s only one choice for your tile tools: RUBI. Visit our page to see everything we have to offer so you can build your project with confidence. Don’t forget, your tile cutter won’t run as efficiently as it should without a good blade. Check out our diamond blades for precision cuts.